Prior Lake played a complete game, winning 21-0 on homecoming. They travel to Eagan in Week 6. Quarterback Colin O’Connor threw for 242 yards and two touchdowns as the Prior Lake Lakers cruised to a 21-0 win over the Burnsville Blaze Sept. 28 at Dan Patch Stadium. The Lakers got things going early. After the defense forced a three-and-out on the first possession of the game, O’Connor connected with receiver Spencer Marlier on a 5-yard route. Marlier broke a tackle and the Blaze didn’t catch him until he got to the Burnsville 32-yard line. A 16-yard completion to wide receiver Parker Ellis later in the drive set the Lakers up with first-and-goal. O’Connor found running back/linebacker Spencer Shaver on a screen pass on the next play; Shaver followed his blockers into the end zone for an early 6-0 lead. The Prior Lake defense got another three-and-out on the next possession and then had some good fortune on the ensuing punt as Burnsville snapped the ball over the punter’s head and into the end zone. The punter scooped up the ball and scrambled around but was met by Shaver, who tackled him in the end zone for a safety. 8-0 Lakers. A few drives later, about midway through the second quarter, the Blaze marched down inside the 10-yard line. However, the Laker defense made a stop and forced a field goal attempt. The Burnsville field goal holder then took the snap and scrambled to his right but Shaver made a tackle to end the threat. The ensuing drive was led by receiver Nick Theis. Theis kicked it off with a 15-yard run and a 5-yard run before O’Connor found him for a completion down the middle of the field. Theis broke a tackle and took off toward the end zone but was caught by a Burnsville defender at the 2-yard line. Shaver scored on a 2-yard run on the next play to push the lead to 14-0 late in the first half. The Blaze had one more opportunity before halftime after a long kickoff return set them up in Laker territory but safety Austin Gordon intercepted a long pass, keeping the score at 14-0 at the half. Facing a third-and-10 on the opening drive of the second half. O’Connor connected with Shaver on another screen pass, who took off and wasn’t tackled until he crossed midfield. The rest of the drive was methodical and capped by a 7-yard touchdown pass from O’Connor to Ellis. Mike Nelson’s extra point was good to extend the Laker lead to 21-0. Both defenses stood tall the rest of the night, giving the Lakers the shutout win in the Battle of Savage, a matchup the Lakers have not lost since they started playing regularly in 2010. Offensively, O’Connor completed 22 of 32 passes for 242 yards with two touchdowns and one interception. Theis was the leading receiver with three catches for 73 yards while Ellis had six catches for 61 yards and a touchdown. Defensively, linebacker Michael Herbst once again led the team in tackles with 11, while Shaver and Gordon each had seven. The Lakers (3-2) will travel to Eagan this week to take on the Wildcats (0-5). Prior Lake enters the matchup ranked ninth in the Star Tribune’s Oct. 3 Class 6A Rankings. The Lakers defeated the Wildcats 44-3 at Dan Patch Stadium in 2017. This year’s Wildcats team is led by tailback Carter Lyons, who has 510 yards and two touchdowns so far this season. Though winless on the season, Eagan has played better each of the past two weeks. 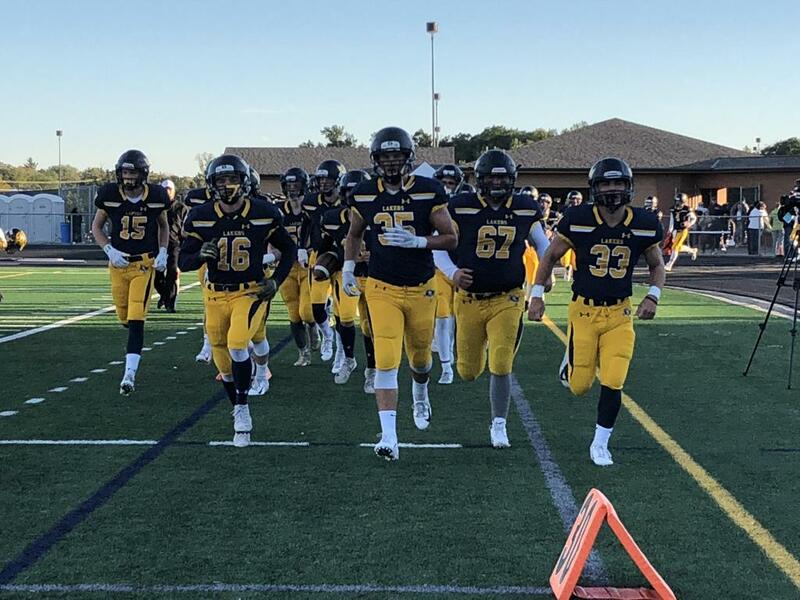 After falling to Minnetonka 42-0, Lakeville South 27-7 and Rosemount 50-7 in the first three weeks, they lost tighter games to Shakopee 14-10 in Week 4 and to Farmington 41-28 in Week 5, a game in which they rallied from a 33-7 deficit. Tickets for the Oct. 12 game against Lakeville North at TCO stadium will go on sale to students and the general public on Monday Oct. 8. Preorder information for parents was sent out in an email to parents earlier this week. Check the district website and social media pages for more information. Kickoff against Eagan on Friday is scheduled for 7 p.m. at Eagan High School. Be sure to check back next week for a recap of the Eagan game and preview of the Week 7 matchup against Lakeville North.